The band leader, Isami Nakagawa is a famous Japanese comic artist. He has made a comic of his band activity! He started to play the guitar in 2009, and other members of the band were also beginners. But they are growing to the extent that they are asked to release CD by major record company. FENDER is paying attention to STRATO☆DANCERS. They’re going to declare new special model of Stratocaster illustrated by Isami Nakagawa in NAMM SHOW!! This event is also the memorial event for releasing new Stratocaster model of STRATO☆DANCERS!! Who’s OYAJI!? OYAJI means elder men in Japanese. And OYAJI means the gentlemen who has good adult atmosphere. 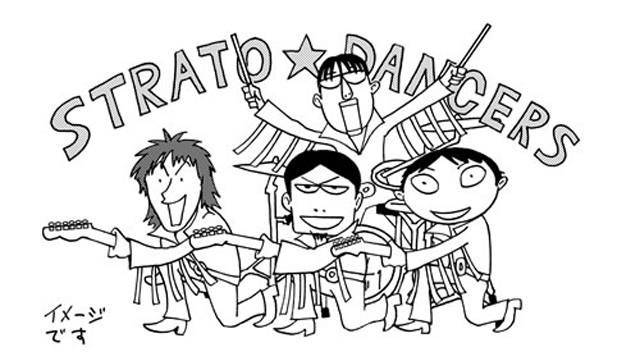 Japanese OYAJIs are worrying about Japanese bad situation…… BUT, STRATO☆DANCERS is the star for them! They will express Japanese OYAJI POWER with the hottest heart of ROCKN’ ROLL! KIMONO is the symbol of Japanese sprit!